A misguided lady who sleeps with every man she meets for money, identified simply as Blessing, have been arrested by operatives of the Inspector General of police Special Intelligence Response Team (IRT) for allegedly blackmailing men with intent to extort money from them. 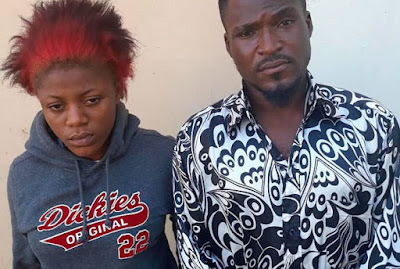 She and her boyfriend, Ibrahim Danladi were said to have blackmailed and extorted money from several men in Abuja, using their (men’s) n*de pictures. Blessing, who claimed to be a 200-level Philosophy undergraduate of the Federal University, Nasarawa State, was apprehended alongside Danladi, also a student of the university. They were trailed to their hideout in Maraba area. It was said that Blessing and her boyfriend ran into trouble, after one of their victims, identified simply as Danti, paid a sum of N150,000 to avoid being blackmailed. Buoyed by the victim’s payment, the suspects allegedly went ahead to demand an additional N300,000, threatening to kidnap the man's wife and children if he failed to comply. The man, out of fear of being further blackmailed, wrote a petition to the Inspector General of Police, Ibrahim Idris, alerting him of the situation and he immediately directed his operatives at the IRT headed by Abba Kyari, to go after the alleged blackmailers. The source said the operatives advised the man to play along with them. Danladi, who was the one communicating with the victim, was apprehended when he was about to collect the ransom at his hideout in Kubua area. Danladi confessed during interrogation that his girlfriend, Blessing, brought the n*de pictures and phone numbers of the men, which they in turn used to blackmail their victims. His words, “It was my girlfriend’s idea. She brought the pictures to me and said she wanted to blackmail and extort money from the victims. I didn’t know them (victims) before; she was the person who gave me their phone numbers. A source said that it was Danladi who helped the police to arrest Blessing. In her confession, Blessing said: “I am not a blackmailer; neither am I a pros-titute. I was just broke and I was looking for money. My boyfriend and I came to Abuja when our school was on holiday to look for money but things were not looking too good for us. Therefore, I went to the streets of Abuja to see how I could help myself. "One of such days, a man in a vehicle gave me a ride to Gwarimpa area and while in the vehicle, he requested to know more about me and I told him who I was. I told him that I was seriously broke and that I needed to prepare for school resumption and he offered to assist me. "He took my phone number and promised to call me. Few days later, he called and asked me to meet him in a hotel at Garki area. When I got there, we had s*x after which he gave me N5000, but I told him that the money would not be enough, because I had to buy foodstuffs and other items I would need, but he said that was all he had. ‘’So I took his n*ked picture while he was standing and gave it to my boyfriend, who contacted the man and demanded for money by threatening to upload it on the internet, but the man ended up not paying any money to us. "I also met one Gado at Wuse Zone 2, and we had s*x. I told him that I needed money for school but he gave me just N4000. I also took a photo of him while he was naked and gave it to my boyfriend for blackmail and to extort money from him. I also blackmailed a man who offered to give me a job after sleeping with him. The man later gave me his business card and asked me to call him and when I called him, he invited me to a hotel and we had s*x, after which he gave me just N1000 and asked me to call him later for the job he promised. "I took his picture while he was n*ked and I sent it to my boyfriend, who started blackmailing the man and threatened to publish it online. The man became tired and told him to go ahead and he stopped talking to the man. "The one that landed us into trouble was that of a man named Danti whom I met in an eatery at Jabi area of Abuja and we became friends. He later took me to a hotel at Lugbe area, where we had s*x and I took a picture of him after he finished taking his bath and he gave me N5000 after the whole show. "I was angry because I was expecting him to give me more money. I gave his n*de picture to my boyfriend and this time, we ran a search on him and we found his wife and other family members on social media. Blessing and her boyfriend, Danladi will be charged to court in Abuja.